Photo cred: Trican Well Service Ltd. The oil and gas industry’s impacts on land include access roads, seismic lines, wellsites, pipeline corridors, worker camps, storage areas and facilities, processing plants, compressor and pumping stations, as well as other miscellaneous infrastructure of various sizes. It’s important for an operator to plan its job site to maximize the efficient use of space, organizing access and infrastructure for optimized work flow and cost savings. Minimizing the surface area needed to carry out industry activities, such as hydraulic fracturing or fracking, makes both environmental and business sense. Fracking involves an increased level of activity over a relatively short phase of the oil and gas life cycle. 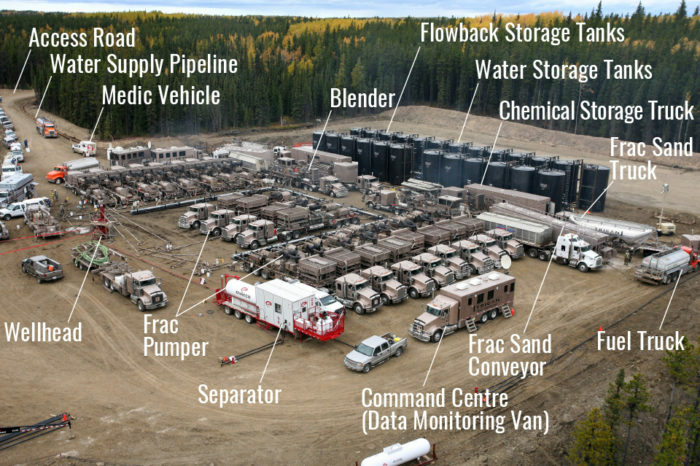 While the actual fracking process occurs deep underground, a significant amount of vehicles, equipment and materials including water, sand and chemicals need to be transported to the wellsite in order to carry out fracking operations. Companies are beginning to explore how equipment could be designed to reduce the jobsite footprint. If the number of equipment pieces required on-site could be reduced, the operational pad size, vehicle emissions, and the amount of heavy traffic could also be decreased. Implementing measures to reduce the cumulative impact of oil and gas activity in a region. Plans and practices must be in place to minimize the risk of spills or leaks from chemicals and frac fluids at the wellsite. Spillage prevention measures help to determine how the wellsite is constructed. The rise in the use of fracking technology has seen a corresponding move to horizontal drilling. Horizontal drilling allows contractors to drill wells vertically to start, and then run them horizontally for several kilometres. When combined with multi-well pads (many wells from a single location), horizontal drilling minimizes the surface footprint and environmental impacts. More efficient way to establish and enforce noise, light, air emission and water plans. Companies and regulators in British Columbia and parts of Alberta use a project- or area-based planning approach (also called ‘play-based’) to evaluate the longer-term development planned for a region. The planning approach enables them to better assess potential cumulative land, water and air impacts and put measures in place to reduce the environmental impacts. Play-based planning also encourages collaboration among operators to better coordinate infrastructure development, such as building roads, pipelines and water reservoirs that can be used by multiple operators. The company is also responsible for making sure that reclamation efforts are successful by assessing vegetation efforts one year following planting and then every five years. Soil must also be tested for chemicals and other physical properties. Once it has been determined that reclamation has been properly completed, government regulators will issue reclamation certificates (e.g. AB and BC). Oil and gas activity, including fracking, brings a number of economic benefits to a region as companies source goods and services locally. The industry also recognizes the need to manage potential nuisances like noise and traffic for the local community. Producer companies and frac companies have established codes of conduct to guide company behavior during periods of fracking activity. The industry is continually seeking opportunities to establish and maintain communication with all those affected by their activity. 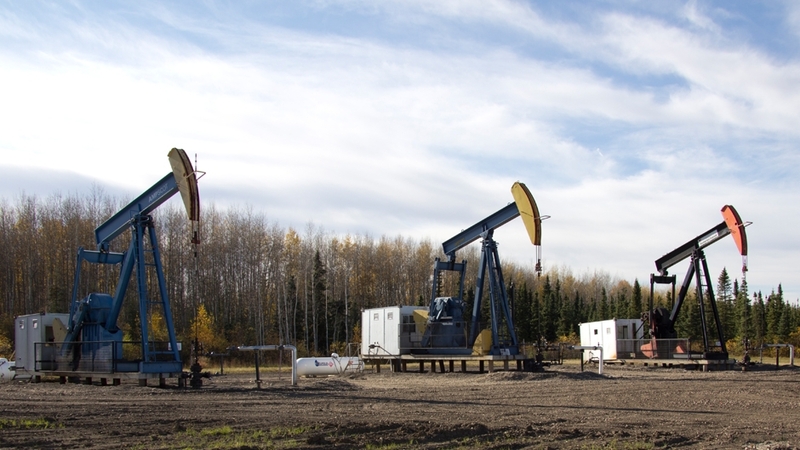 In Alberta, Synergy Groups have been established to facilitate constructive dialogue among community members, landowners, business owners, the oil and gas industry and regulators – bringing everyone together to find solutions to local issues. Fracking causes very low magnitude earthquakes that are rarely felt on the surface. The micro-seismic activity induced by fracking is planned, managed and monitored. Once a company has reclaimed a well, it is no longer responsible for it. Companies must ensure reclamation efforts are successful by assessing vegetation efforts one year following planting, and then every five years afterwards. Soil must be tested as well.